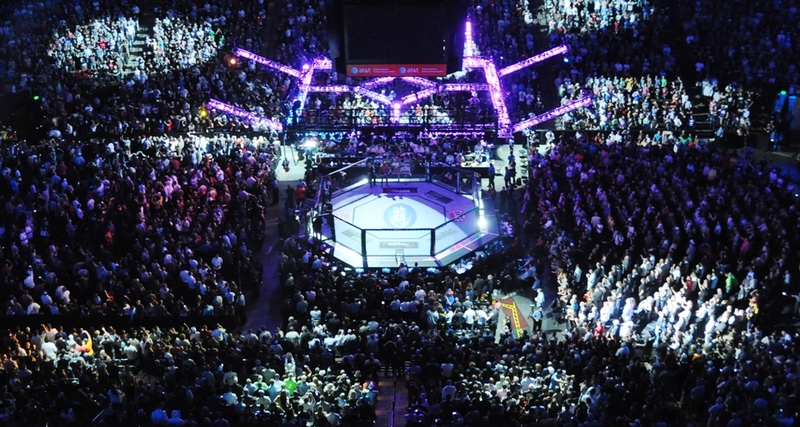 On Saturday, Oct. 25, the UFC returns to Brazil for its first pay-per-view in the country since last August. While the promotion has made numerous visits to the country since then, none have been as important as this card. 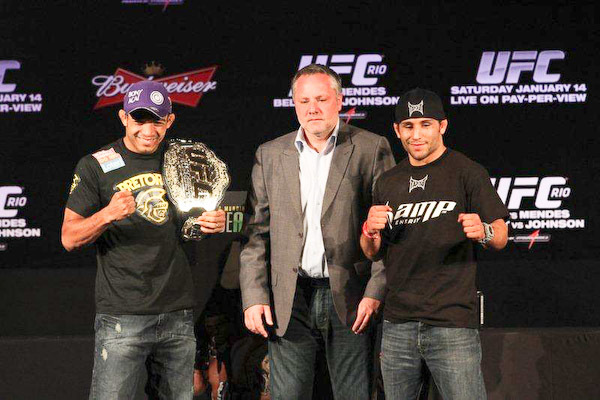 In the night’s top billing, UFC featherweight champion Jose Aldo will put his belt on the line against Chad Mendes. The pair met previously at UFC 142, with the Brazilian Aldo scoring a violent, first-round knockout of the wrestler. Since then, Aldo has defended his belt three times and Mendes has reeled off five straight wins to earn another shot at gold. The main card also features a high-profile fight in the light heavyweight division as former title challenger Glover Teixeira faces off with Phil Davis. Both fighters will look to get back in the win column after tough outings at UFC 172 in April. The 11-fight event will kick off Saturday with two preliminary card bouts streaming on UFC Fight Pass at 7 p.m. ET. Four additional prelims follow at 8 p.m. on Fox Sports 1, with the five-fight main card kicking off at 10 p.m. ET on pay-per-view. Combat Press writers Bryan Henderson and Rob Tatum square off to preview the card in this addition of Toe-to-Toe. Jose Aldo has made another three successful title defenses since knocking out Chad Mendes in 2012, and Mendes rebounded from the knockout loss with five convincing victories. It’s time for the rematch, but will it go any differently than their first meeting? Henderson: These two men have been at the top of the featherweight division for several years now. Aldo claimed the WEC title in 2009 and was promoted to UFC champion in 2011 when the UFC shuttered the WEC and absorbed the smaller promotion’s roster into its own. He hasn’t been without a gold belt in nearly five years. Mendes was climbing toward a WEC title shot when the promotion ceased operations, and he was lined up with Aldo after picking up just two UFC victories. The two top 145ers met at UFC 142, and Aldo ended the contest when he landed a knee to the head of Mendes with just one second remaining in the first round. So, what’s changed since then? Well, Aldo dealt with some injuries before finally returning more than a year later to defend his strap against Frankie Edgar in a “Fight of the Night”-winning contest. Then, he scored a TKO finish of Chan Sung Jung and, most recently, notched a decision victory over Ricardo Lamas. Aldo still uses his leg kicks to chop down opponents, and he’s still the same fighter whose biggest issue lies with his gas tank. He has thrown in the occasional takedown in his more recent defenses, but it’s doubtful that he’d attempt to close the distance and tie up with a skilled wrestler like Mendes. Mendes, meanwhile, has turned into a finisher. Before his fight with Aldo, the Team Alpha Male product had four stoppages through 11 fights, and only one of those finishes came within a Zuffa-owned organization. Since Aldo landed the devastating knee that knocked out Mendes, “Money” has been a good bet to get the finish. His next three fights checked in at 31 seconds, 115 seconds and 68 seconds. They all ended via knockout. He has started slipping back toward the scorecards more recently, however. He needed more than two rounds to finish Clay Guida by TKO and went the distance in his most recent victory, which came against Nik Lentz. Mendes has evolved more than Aldo by finding his own killer instinct. Their first meeting was one of Aldo’s trademark performances. He stuffed most of the takedowns Mendes attempted and popped back up within seconds when he was taken down. On the feet, he slowed Mendes with his punishing leg kicks and, of course, landed the knee that separated the wrestler from consciousness. That’s almost all of Mendes’s game neutralized for five minutes. Mendes has power in his hands, and he has improved in his use of that power. However, that might not be enough to change the outcome of this fight if he’s fighting a motivated and healthy Aldo. This fight will take a different course than their first encounter, but only because Mendes will modify his approach and seek to play off of his knockout power. He knows that he can’t reliably plant the champ on the mat and keep him there, so he’ll try to hunt for the finish on the feet. That will just put him at range for Aldo’s leg kicks. After enduring those kicks for 25 minutes, Mendes will emerge on the wrong end of the judges’ verdict. Tatum: The pair’s first meeting was mired in a bit of controversy, as Aldo used the cage to fend off Mendes’ efforts to get the fight to the ground. Regardless, it’s unlikely that the outcome of the fight would have been any different. Just don’t tell that to Team Alpha Male. As my colleague said, there’s no reason for Aldo to change his approach in the rematch. He’s the champion for a reason. The Brazilian uses his speed and striking to batter opponents and never mind the fence grab at UFC 142, Aldo has showcased excellent takedown defense throughout his career. He’s faced plenty of wrestlers during his title reign, including Lamas, Edgar and Mendes’s teammate, Urijah Faber. And in those fights, Aldo did not spend much time on his back. Bryan detailed the evolution of Mendes since the pair locked horns in early 2012. Working under the tutelage of Duane “Bang” Ludwig, Mendes has shown vast improvement on the feet. His five straight wins have earned him a deserved rematch with the champion, but there’s still a big red flag about the 29-year-old: he hasn’t fought anyone with the striking prowess of Aldo during his streak. Knocking out overmatched opponents like Cody McKenzie and Yaotzin Meza and besting fellow wrestlers like Guida, Lentz and Darren Elkins is no easy task, but none are a true measuring stick for how Mendes will stack up with Aldo for a second time. Let’s be honest, Aldo is the greatest pound-for-pound fighter on the planet and it’s going to take a special performance to dethrone him. Mendes is a great fighter, but his skill set has failed many times against the champion. I agree with Bryan that Aldo will keep the belt in Brazil on Saturday night, but I believe it will come via a fourth-round TKO. Glover Teixeira and Phil Davis each entered the UFC with a ton of hype. Davis was an athletic wrestler with a blossoming MMA career and Teixeira was the veteran who finally realized his dream of fighting in the UFC after years of bouncing from promotion to promotion. Now, each is coming off a loss. Is either fighter capable of using this bout as a turning point to put their career back on track? Tatum: UFC 172 was a rough event for these two light heavyweights. Teixeira saw his 20-fight winning streak snapped by current champion Jon Jones and Davis was thoroughly dominated by a resurgent Anthony “Rumble” Johnson. The Brazilian Teixeira entered the UFC with a ton of hype after struggling with visa issues for years. 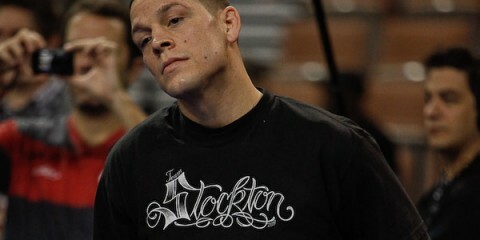 Once he made his long-awaited Octagon debut, he quickly validated the excitement surrounding him. Five straight wins, including four by stoppage, earned him a crack at Jones, but like so many before him, he could not solve the champion. Now, at 34 years of age, Teixeira must climb the ladder once again. Davis, meanwhile, had one of the worst performances of his career in Baltimore last April. Like Teixeira, Davis also entered the UFC with a fair amount of promise after winning a national wrestling title at Penn State. He also reeled off five straight to open his UFC career, but fell short against Rashad Evans when it mattered most. He then bested a trio of Brazilians, including a controversial decision win over former champion Lyoto Machida, to put himself into title talk once again. But the wheels came off yet again when he faced Johnson. Ultimately, this fight comes down to which fighter is more equipped for success in MMA. While Davis has the wrestling pedigree to be an elite fighter, his striking has not evolved to a level where he can compete with the sport’s best at 205 pounds. Davis needs this fight more from a long-term perspective, but Teixeira has faced and beaten fighters more dangerous opponents than Davis. Teixeira will need to do more than get past Davis to get back into title contention, but look for him to cruise to a decision win on Saturday night. Henderson: Davis came into the UFC with more than just a “fair amount of promise.” When he entered the league in 2010, a lot of people were looking at him as the long, athletic wrestler who could develop into a long-term rival for Jon Jones, who was already well into his march toward a UFC light heavyweight title reign. It was all a matter of developing his submissions to go along with his wrestling base. Or it was about developing his striking to go along with his wrestling base. His improved submission game has been on display at times with impressive anaconda chokes of Alexander Gustafsson and Wagner Prado and a modified kimura finish of Tim Boetsch. His striking? Well, that’s another story. He tends to struggle when he can’t get the fight to the mat. Evans and Johnson were able to notch unanimous decisions over Davis, and Machida should have won his fight with Davis, too. What I’m getting at here is that Davis has blown every major opportunity he’s had, and the one he supposedly capitalized on was more of a gift from the judges than a well-deserved victory. Teixeira, meanwhile, has put on exciting wars on the feet. He also happens to hold a black belt in Brazilian Jiu-Jitsu to round out his game. The visa issues he dealt with earlier in his career have undoubtedly shortened his potential time in the UFC, but this is a guy who steamrolled the competition en route to his title shot. 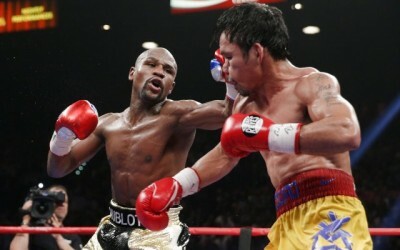 He lasted five rounds with the champ, even if it was a rather one-sided fight. Unlike Davis, Teixeira didn’t get many opportunities against fellow top contenders before jumping in the deep end with Jones. Where Davis had fights with Gustafsson, Evans and Machida, Teixeira’s toughest tasks were a declining Quinton “Rampage” Jackson and borderline contender Ryan Bader. He still has a lot to prove, but he has the better skill set with which to do it. I’m sorry to burst anyone’s bubble, but neither of these men is going to experience a title reign inside the Octagon. Teixeira, however, has the potential of getting closer than Davis. The Brazilian’s powerful striking and overlooked grappling skills put him in a league above Davis, whose failure to evolve on the feet will hold him back. Whereas Teixeira’s go-for-broke style could make for interesting, anything-can-happen fights with the likes of Gustafsson, Evans and “Rumble,” it’s difficult to imagine Davis mounting a significant challenge to any of those men. Yes, he once choked out Gustafsson, but how many people would put money on that happening again? Teixeira will get the upper hand on Davis through an aggressive striking attack. It’ll be enough to put the Brazilian ahead on the scorecards for the victory. Teixeira will use the win as the launching pad for another run at the title, while Davis joins the likes of the aforementioned Bader as a mid-level gatekeeper. An injury to Jose Aldo earlier this summer led to the UFC canceling an event for only the second time in its history. Will Aldo’s injury history overshadow his excellence in the cage? If he loses to Mendes, will the UFC think twice about giving him a rematch? Henderson: Despite all of Aldo’s injuries, it’s not like we hear a constant debate about those injuries and subsequent canceled bouts when Aldo is gearing up for a title defense. He seems to have avoided an overwhelming set of questions on the topic, and this despite a history of back problems, which can be a huge concern for an athlete in any sport, let alone one as physically harsh on the body as mixed martial arts. Aldo has pulled out of fights four times while citing injury. That equates to an average of one withdrawal a year. With the exception of 2012, though, Aldo has kept up his typical pace of two fights per year in the UFC. Would the UFC like to see him fight more often? Probably. Will the company hesitate to give him a rematch if he loses? Doubtful. 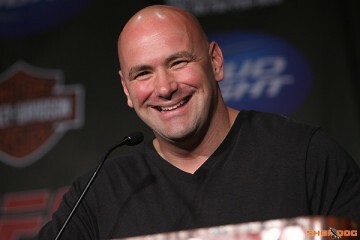 UFC President Dana White can hold grudges and get mad at champions for destroying events by refusing to defend their belts (see: Jon Jones), but he, along with the rest of the UFC brass, seem to have a rather tolerant approach to injuries. The promotion was very patient with former bantamweight kingpin Dominick Cruz before stripping him of his title after he spent more than two years on the sidelines. Cruz is already being entertained as a potential challenger to the belt after only recently proving he can make it back into the Octagon without suffering a setback. Bantamweight contender Cat Zingano tore her ACL—the same injury that sidelined Cruz—and sat on the bench for nearly a year and a half, but after just one victory upon her return, the UFC seems poised to grant her a title shot. The reality in MMA right now is that fighters get injured all the time. The UFC could give Aldo an immediate rematch or stick someone else in as the challenger, but the risk is still high that either hypothetical champion Mendes or his hypothetical challenger would get injured and the bout would change. If anything, the UFC is bound to think twice about not having a backup plan regardless of the injury histories of its headlining fighters. Aldo has put together a dominant run as the one and only featherweight champion in UFC history. The only other belts in the promotion to have a list of champions consisting of just one person are the flyweight and women’s bantamweight divisions, both of which have a shorter history than the featherweight title. At this point, only Georges St-Pierre and Anderson Silva can claim longer title reigns than the one Aldo is currently enjoying. That’s going to earn the Nova Uniao fighter the benefit of the doubt with the UFC, and it’s all that will be needed to convince the UFC to give Aldo a chance at a rematch if he loses the belt to Mendes. Tatum: I think Bryan hit the nail on the head with this one. Undoubtedly, the UFC was not happy about canceling another pay-per-view event, but unlike the promotion’s previous canceled event, UFC 151, no one was being called a sport-killer. Maybe it was timing, or maybe it was the fact it was the champion and not the challenger that pulled out, but either way, the UFC spent much less time disparaging Aldo than Dan Henderson or Greg Jackson. However, Aldo’s inability to stay healthy has to frustrate the UFC, as well as fans. Whether it’s his neck, his back or a motorcycle accident, having one of the best fighters on the planet sidelined is not good for the sport. Yet, the Brazilian’s success inside the Octagon and stranglehold on the featherweight division affords him some leeway. As Bryan pointed out, numerous other fighters have been given the UFC’s support, and Aldo is likely to earn the same backing. 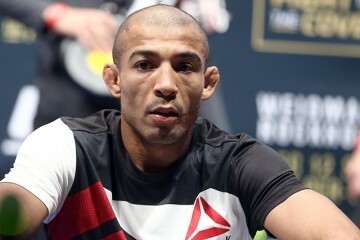 Should Mendes find a way to dethrone Aldo in Brazil, it’s just a matter of when, not if, Aldo would get a rubber match. Sure, Aldo’s health would be a factor, but given the promotion’s propensity of rematches in recent years, it’s hard to fathom that the company would treat one of the sport’s best any differently. At the top of the preliminary card bill, we have a fight between The Ultimate Fighter 16 alum Neil Magny and TUF Brazil 2 alum William “Patolino” Macario. Magny has quietly worked his way to a four-fight winning streak after suffering losses in back-to-back fights in late 2013. Is Magny the real deal? Can he continue his streak against Macario? Tatum: This is a bout that was originally slated to take place in May at UFC Fight Night 40, but Macario was forced off the card. Magny went on to beat Tim Means at the event and has scored two additional wins over Rodrigo Lima and Alex Garcia since. The 27-year-old will be seeking his fifth straight win, all within 2014, which would be a UFC record for wins in a calendar year within the Zuffa era. Magny’s development has come, in large part, with a move to Denver to train full-time. The former All-Army Combatives champ has harnessed his length and uses his jab to keep his opponents at range. His 81-inch reach is a huge weapon at 170 pounds and it will be a key factor against the hard-hitting Macario. Macario is a very explosive striker with a propensity for knockouts. In fact, his UFC 168 win over veteran Bobby Voelker was the first time he had seen the scorecards in his career. The Brazilian is a bit wild with his striking, and his extended absence from the cage could affect the outcome of this contest. Other than Magny’s fight with Mike Ricci on The Ultimate Fighter, he’s never had issues with strikers. He’ll weather Macario’s early storm before settling in on a consistent diet of jabs from range. In the end, Magny earns a decision win and makes a case for top-15 consideration. Henderson: Ricci’s victory is only the beginning when it comes to my doubts in the Denver-based fighter. He’s on a four-fight winning streak, but let’s dive deeper into those wins. After losses to mid-tier fighters Sergio Moraes and Seth Baczynski, Magny bounced back with an impressive showing against Gasan Umalatov, a fighter who is now just 1-2 inside the Octagon. Next, there was his fight against Means. It was another dominant display by Magny. His next two victories were a different story. Lima out-grappled Magny through one round before Magny found renewed success with his striking, and Garcia also presented Magny with problems on the ground and kept their fight close. It’s not a huge argument against Magny’s ability to keep this winning streak going and continue his climb up the UFC’s welterweight ladder, but it certainly plants a seed of doubt. Can he find success in a division stocked with wrestlers who would be more than happy to take him to the mat? Magny has already demonstrated his capabilities against the UFC’s lower-level fighters, and Macario is hardly a huge step up. The Brazilian’s wild striking attack could allow him to get lucky against Magny, but this seems like another fight the TUF alum should take with ease on the scorecards. It’s what comes next that will make or break Magny as a legitimate fighter on the rise. With five straight wins, that top-15 consideration is sure to follow. With it, Magny will see increasingly tough opponents who will expose the weaknesses that men like Lima and Garcia failed to capitalize upon. Henderson: UFC 179’s main event features a pair of veteran fighters who have each experienced just one loss in their lengthy careers. There are three other fighters competing in Rio de Janeiro who have just one loss on their resumes, and there are two additional fighters who have yet to suffer their first professional losses. However, in only one instance outside of the championship tilt are two of these men set to step into the Octagon against one another. That’s why the lightweight tilt between Carlos Diego Ferreira and Beneil Dariush is my pick for the sleeper match-up of the evening. Ferreira stepped in on roughly four weeks’ notice to replace fellow undefeated fighter Alan Patrick in this contest. 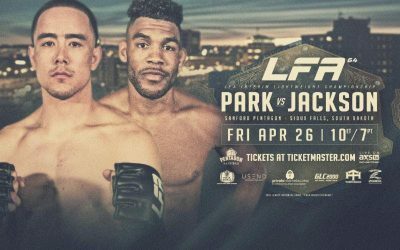 The 29-year-old Brazilian caught everyone’s attention under the Legacy banner with decision wins over UFC veteran Carlo Prater, prospect Chris Feist and, in a five-round affair for Legacy’s lightweight title, respected veteran Jorge Patino. However, Ferreira has turned up the intensity since arriving on the biggest stage of all. He announced his arrival in June with a 38-second submission finish of The Ultimate Fighter 16 winner Colton Smith. Two months later, he was back in the Octagon opposite Ramsey Nijem. Ferreira opted to show the world that he had some knockout power to go along with his grappling game, as he finished Nijem via a second-round TKO. The Brazilian Jiu-Jitsu black belt may have just one TKO to go along with six submission finishes, but his striking game has been instrumental in his success thus far. Now, he’ll return after another brief, two-month layoff to fight Dariush. Dariush makes for an intriguing opponent for Ferreira. We’re not talking about an inexperienced fighter with a losing record (Smith) or a fighter with a questionable chin (Nijem). Dariush, like Ferreira, is a well-rounded combatant who doesn’t tend to lose often. In fact, he’s only lost once. Oddly enough, it was Nijem who handed Dariush the lone defeat of his career via TKO. Despite the loss, Dariush remains a solid prospect with an 8-1 overall mark and a 2-1 record in the UFC that includes victories over Charlie Brenneman and Tony Martin via submission. He’s a BJJ black belt under Romulo Barral and a Muay Thai black belt under Rafael Cordeiro. 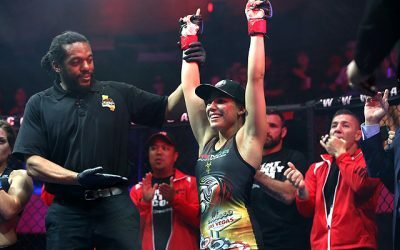 The 25-year-old has five submission wins and two victories by way of knockout or TKO. These two lightweights have seen the judges in just five out of a combined 20 outings. Both are talented grapplers who also have strong striking bases. Each has an opportunity to establish their name in the UFC’s 155-pound weight class while competing on the main card of a pay-per-view effort. 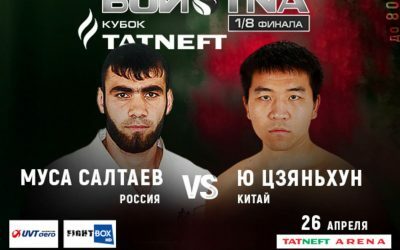 That’s definitely enough to keep me interested, even if this fight isn’t getting the same attention as the high-profile bouts that top the lineup. It’s also the recipe for a good sleeper fight. As for the outcome? I think Ferreira can extend his streak and deliver another convincing victory. Tatum: The fight that I expect to steal the show in Rio is a flyweight scrap between former WEC title challenger Scott Jorgensen and Bellator and EliteXC veteran Wilson Reis. At first glance, Jorgensen’s five losses in his last seven outings might be alarming, but you have to look at his list of opponents. 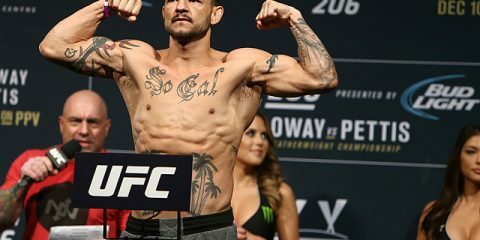 Those losses have come against former champion Renan Barao, former title challengers Eddie Wineland and Urijah Faber, former Bellator and RFA titleholder Zach Makovsky and former Tachi Palace Fights champion Jussier “Formiga” da Silva. The 32-year-old got back in the win column in July with a decision win over Danny Martinez. “Young Guns” is a former three-time Pac-10 champion at Boise State and has developed a solid boxing attack. Reis, meanwhile, has reinvented himself at 125 pounds. Like Jorgensen, the Brazilian’s record is filled with tough losses. 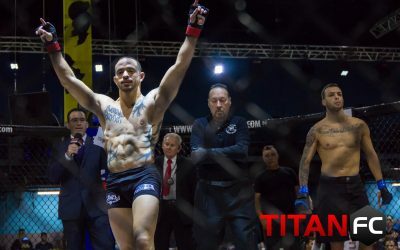 The former EliteXC bantamweight champion has fallen against the likes of former UFC title challenger Joe Soto, former Bellator champ Eduardo Dantas and current Bellator titleholder Patricio “Pitbull” Freire. Reis is a World champion in jiu-jitsu, but he isn’t afraid to stand and trade on the feet. This fight may not have title implications, but it will feature two hard-nosed veterans that fight at a high pace. If this fight hits the mat, which I expect it to do, it will be intriguing to see if the submission game of Reis can find an opening in Jorgensen’s defense. And if not, will Jorgensen be able to use his wrestling attack to tire out the Brazilian? 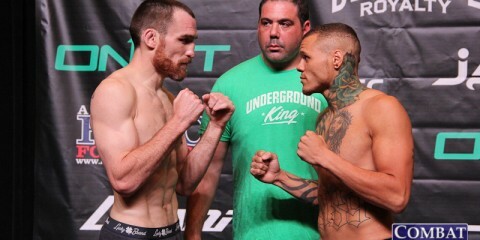 I’ll go with the latter and expect Jorgensen to claim the decision win. Tatum: A plate of feijoada. I’m guessing your reaction was along the lines of “What the heck is feijoada?” but since this card is taking place in Brazil and is full of Brazilian fighters, what’s more appropriate than a dish that is considered by many to be Brazil’s national dish? But, if black beans, rice and a variety of meats doesn’t sound appetizing to you while watching talented fighters like Jose Aldo and Glover Teixeira do their thing, find a way to experience some Brazilian culture while enjoying a great night of fights. Henderson: A couple bottles of Xingu Black. Once you try the feijoada, you’ll need something to wash it down. Why not continue the cultural experience with a beer from Brazil? The rich flavors are a perfect complement to a card filled from top to bottom with Brazilian talent that will keep fans interested from the night’s opening bell.